Thank you to those of you who joined in our Female Birthday challenge last time, the entries were gorgeous. Challenge #7 over at Crafting When We Can Challenges should be easy for you all to enter you have to choose a sketch from another challenge and use this. 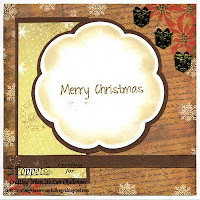 You MUST credit the challenge you have taken the sketch from on your blog and then hop over to CWWCC and enter your card. The image I chose is 'Checking the List' I thought she was sooo cute checking her long, long list of nice children (and adults too!). The sketch came from 'Sketch N Stash' their sponsor this week is Meljen Designs. I know brown isn't a usual colour for Christmas but I've had these papers for a couple of years now and have only used them a couple of times. The image was coloured with Promarkers and Copics, Spellbinders for the mats, the papers are from Paper Cellar, the sentiment is from Craftwork Cards and the little gold parcels are from the tables at last years works Christmas Party the ribbon was around a box of Chocolates. Adorable image! Your paper colors work well for this holiday card! thanks for joining us at SOS! Thank you so much for playing along @ Paper Creations Ink! Hi Poppet this is such a pretty card! I love the image. This is lovely. Your image is gorgeous & I love those little presents. Great take on our sketch. Thanks for joining us at Sketch & Stash.